Based on one of Hans Christian Andersen’s most beloved stories and the classic animated film, Disney’s The Little Mermaid is a hauntingly beautiful love story for the ages. 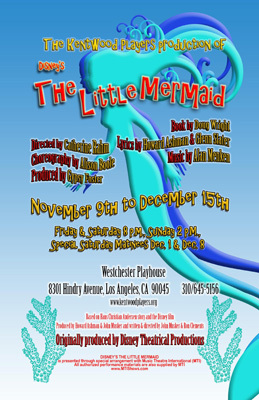 With music by eight-time Academy Award winner, Alan Menken, lyrics by Howard Ashman and Glenn Slater and a compelling book by Doug Wright, this fishy fable will capture your heart with its irresistible songs, including “Under the Sea”, “Kiss the Girl” and “Part of Your World” Ariel, King Triton’s youngest daughter, wishes to pursue the human Prince Eric in the world above, bargaining with the evil sea witch, Ursula, to trade her tail for legs. But the bargain is not what it seems, and Ariel needs the help of her colorful friends, Flounder the fish, Scuttle the seagull and Sebastian the crab to restore order under the sea. Due to expected demand for tickets we have added two Saturday matinee performances for The Little Mermaid on December 1 and December 8 at 2pm. Ariel saves Prince Eric from drowning. Ursula offers Ariel a dangerous deal. Prince Eric flirts with Ariel. Ursula, the Sea Witch, threatens Ariel.